This website is a service provider for the East Asia Architecture Information Network. The original documents from the Architectural Institute of Korea and the Architectural Institute of Japan are now available for you to read online, and you can also find a wide range of architectural information from Korea and Japan. We are planning to expand our services to other East Asian countries hereafter. The world in the 21st century is reshaping itself into a number of cultural and economic areas, and East Asia is getting the most attention from the world. The cooperative system between East Asian countries has a long history and it will continue to grow in the future. Interchange and cooperation between East Asian countries are keenly needed in the field of architecture, which is an integration of society, culture and economics. At the same time, the system that can provide the most updated information rapidly and in an easily usable form is an essential element of quality education and technological development, since the amount of information is increasing at an unbelievable rate. Hereupon, the online information exchange network in the architectural field, eAINA (East-Asian Information Network for Architecture) is now leaving port. 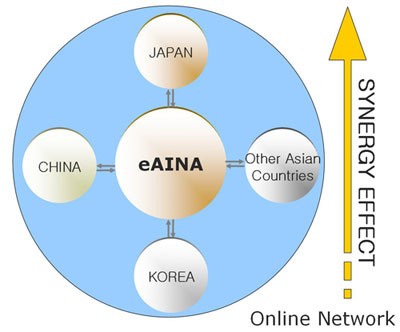 eAINA is the network that shares information in architecture between the East Asian countries online, and the CRIC (Construction Research Information Center) of Seoul National University, which is the representative architectural online information distributive institution in Korea, is leading the project. The Power Search Service provides all the research information from the eANIA member countries. With the Power Search function, you can search all the documents and event information, as well as the online seminar DB that eANIA provides using one search keyword. It also provides a cross-language search system so that anyone using any of the languages in eANIA member countries can search for all other languages. This allows users to search information from other countries easily without any language barriers. The Document Service provides all kinds of documents in their original format, including research papers, journals, academic/institutional papers, organizational papers, study papers and technology reports from all participating countries. This service provides information about academic conventions, conferences, seminars and educational events from all participating countries in eANIA. The Event Information Service allows users to search event information from all eANIA participating countries with one keyword, so that researchers from each country can access the most uptodate architectural trends both inside and outside of their own country. The Event Information Service provides related event schedules with a calendar-based system, making it easier to recognize the schedules at a glance. This service allows users to participate in seminars from all eANIA participating countries online without being restricted by time or space. For more effective use of seminar data, we use the online seminar automated system, with a DB of seminar presentations and multimedia data allowing all types of presentation data, including PowerPoint and slides to be provided with video files. eANIA is built upon the voluntary participation of architectural information production sectors such as academic institutions, schools, and business organizations in East Asian countries. If you want to participate in this network so as to be a part of East Asia information exchange network, send us an e-mail at the below e-mail address and we will contact you. There is no fee for network participation. The Construction Research Information Center will be in charge of constructing the DB and data digitalization of participating institutions.